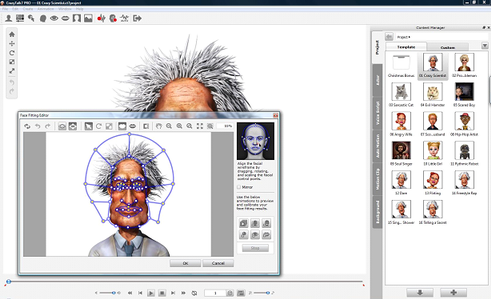 This is not a new product but is the latest version of the well-established Crazy Talk facial animation software. There are two versions of crazy talk available depending on how much control you need over your animation. The Standard version which covers all the basic functions including auto lip-sync, and the ability to edit on a timeline and the Professional version discussed here which gives the extra control refinements required by professional animators. These give advanced auto motion capability, multiple audio tracks, detailed facial movements and other features that allow more precise control over the animation. A more detailed comparison of the two versions can be found on the Reallusion website. The working environment features dockable panels allowing the toolbars, content manager and timeline to be positioned according to personal preference. Creating a basic animation was a straightforward and intuitive process. A project is started by creating a new actor which may either be by importing an existing image, by the use of the computer webcam or alternatively one can start with one of the many supplied actors. Then it is a matter of fitting the Crazy Talk grid to the head, adjusting the settings and checking the results. A selection of teeth and eyes are available and these can be used as required to create your actor. A handy masking tool allows the removal of the background from the imported image which can then be replaced with an alternative image or the tool could be used to change the head to another body. The audio track can either be recorded, imported from an existing file, or created using the supplied text to speech converter. A number of talking scripts are also supplied. 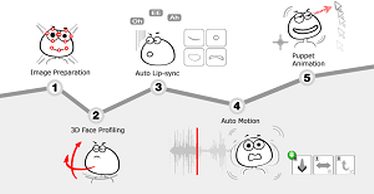 The audio file can be used in listen mode where the actor is animated as if responding to a spoken conversation or in talk mode when lips-sync is applied to the actor. The lips-sync can be modified manually via the Timeline. In both modes Auto Motions are automatically generated but in Talk mode the actor’s actions will be more vigorous at the audio peaks. Having created the animation it can be further refined by setting the characters mood, and changing from the default Auto Motions that were automatically generated. The Timeline is where the detailed animation takes place at a frame by frame level if required and this is where the professional version really shows its added capability. Crazy Talk 7 Pro is an excellent piece of software allowing the user to create stunning animations in an intuitive way without any need to keep looking at the Manual. The Pro version is certainly the one for professionals who need that precise control over every detail of their animation. Be aware that Reallusion have another product in their range namely Crazy talk Animator which rather than restricting the animation to a head allows full body animation and additional features such as the ability to create a full 2-D animation. So before you rush out to buy, check out the Reallusion website to see which product is right for you. Be warned though, this fun to use software is addictive, with the simplicity of changing features or creating different moods you can find yourself experimenting for hours .